In the tradition of Star Wars, comics writer Michael Moreci presents a galaxy-hopping space adventure about a galactic kingdom bent on control and the young misfit who must find the power within before it's too late. Cade's not going to let destiny send him on a suicide run, though. With some help from his friends-rebels and scoundrels alike-Cade's going to use this weapon to chart a new destiny for the galaxy, and for himself. He just has to do so before everyone around him discovers that he's a complete and total fraud. 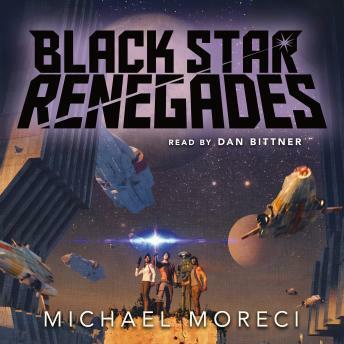 Blending the space operatics of Star Wars and the swagger of Guardians of the Galaxy, Black Star Renegades is an audiobook adventure that blasts its way from seedy spacer bars to sacred temples guarded by deadly creatures-all with a cast of misfit characters who have nowhere to go and nothing to lose. Fantastic space adventure with all the right components to it. Please hurry up with the next volume!